There is not a better place to watch a thunderstorm with lightning striking and putting on a show then from the open space of a farm. A very active spring storm striking above this cool red barn out in the agriculture plains north east of Longmont Colorado. The colors in the clouds are from the city lights of Longmont. One of my most favorite places to watch and shoot a storm. Striking Custom Framed Prints Delivered to Your Door! Worldwide! Custom framed prints by James BO Insogna. Custom this print with hundreds of different frame and mat combinations. Our frame prints are assembled, packaged, and shipped by our expert framing staff and delivered “ready to hang” with pre-attached hanging wire, mounting hooks, and nails. James “BO” Insogna: Artist Website is one of the largest, most-respected custom framers in the world. We stock over 250 different frames which can be used to create museum-quality masterpieces from any print. All framed prints are assembled, packaged, and shipped by our expert framing staff within 3 – 4 business days and arrive “ready to hang” with pre-attached hanging wire, mounting hooks, and nails. Our wholesale buying power allows us to offer frame prices which are typically 25 – 40% less than retail frame shops. Colorado fine art nature landscape weather photography poster prints, decorative canvas prints, acrylic prints, metal prints, corporate artwork, greeting cards and stock images by storm chaser James Bo Insogna aka “The Lightning Man” .com (C) – All Rights Reserved. 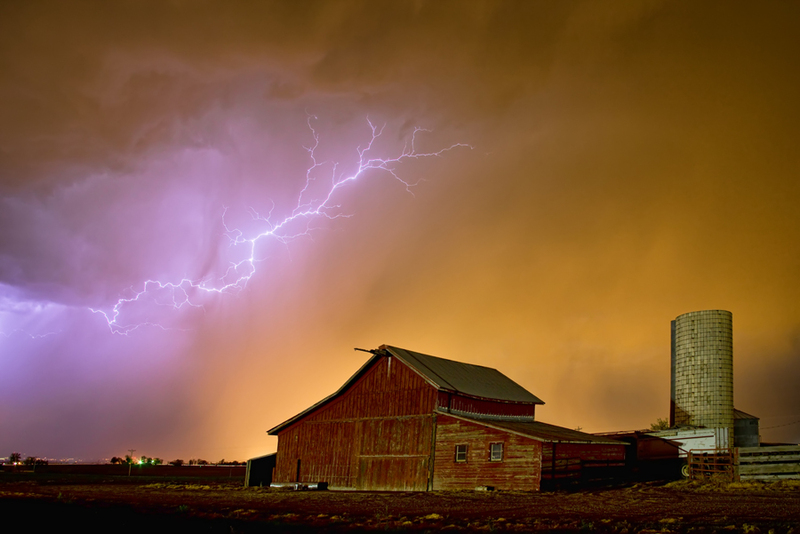 A Colorado spring thunderstorm striking in the late night above a red barn on a farm and what a beautiful sight. This is another one my first storm chase of the 2014 season and what a great show. It was a great night of many images to be had of this beautiful thunderstorm landscape, as you can tell from recent post. If you like my Art Gallery, please spread the word and press the Pinterest, FB, Google+, Twitter or SU Buttons! 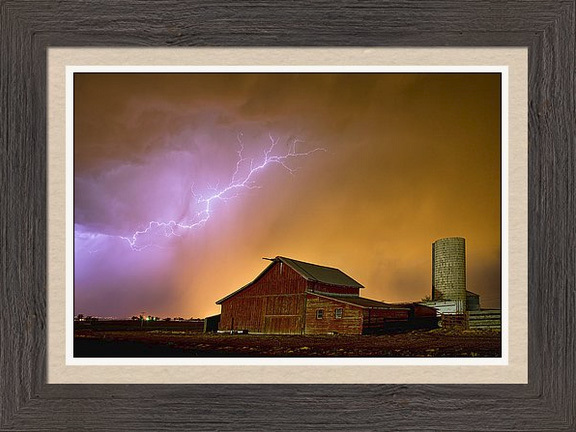 Spring season thunderstorm lightning striking in the late night as this country red barn on this farm North East of Longmont Colorado, in Weld County, south of the town of Meade. It was a great night of watching mother nature put on a fantastic show. great start to the storm season! Portrait view of a cool colorful sky caused by the tungsten city lights of Longmont Colorado lighting up the clouds behind this country red barn as it fades to different colors in the sky and lightning striking above. Fantastic spring thunderstorm putting on a nature show northeast of Longmont, first storm chase of the seasons, and we are off and running! Lohr-McIntosh farm Agricultural Heritage Center, homestead in 1868 on Boulder County open space in northwest Longmont Colorado. The Barn, Silo, Windmill and cattle run with a lightning monsoon thunderstorm striking over head. This was an incredible storm that started building in the afternoon on a very hot summer day with temps in the high 90s. A very fun night for chasing lightning. Get a glimpse into the history of agriculture in Boulder County and enjoy the rural surroundings. This site focuses on the years 1900 to 1925 when local families prospered as farmers and witnessed the coming of the Modern Age. Friday: 10 a.m. – 5:00 p.m.
Saturday: 10 a.m. – 5:00 p.m.
Sunday: 10 a.m. – 5:00 p.m.
A guided tour starts at 11 a.m. Can’t make the guided tour? Follow the self-guided tour using the Brochure Admission is free. Lohr-McIntosh farm Agricultural Heritage Center, homestead in 1868 on Boulder County open space in northwest Longmont Colorado. The Barn, Silo, Windmill and cattle run with a lightning monsoon thunderstorm striking over head and in Boulder in the distance. This was an incredible storm that started building in the afternoon on a very hot summer day with temps in the high 90s. A very fun night for chasing lightning. 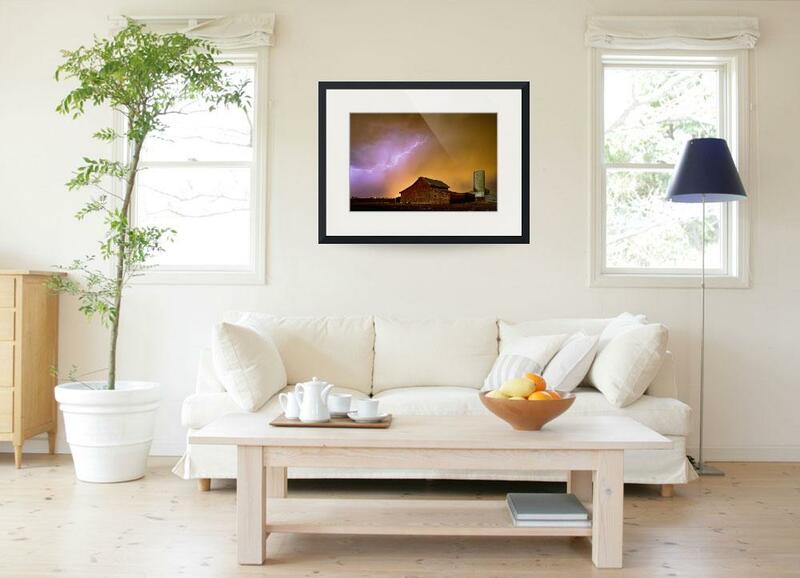 Please click on the image for the fine art lightning photography gallery.